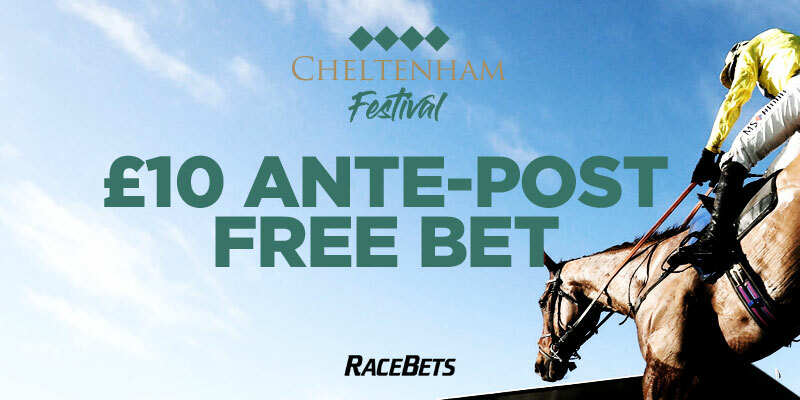 IT'S just over seven weeks until the ‘Greatest Show on Turf' begins and you can WIN a £10 Free Bet on any ante-post market at the Festival thanks to our friends at Racebets. The Cheltenham Festival kicks-off on Tuesday March 12th 2019 and the countdown starts here. Racebets already have ante-post markets available for 17 races at the Festival including the Cheltenham Gold Cup, where the market is headed by Presenting Percy at 7/2, the Ryanair Chase in which Min is the favourite at 4/1 and the Champion Hurdle, where Nicky Henderson's Buveur D ‘Air is the one to beat at 6/4. If you don't already have a Racebets account then simply comment “Racebets” in the comments section below to be included in the draw to receive one of five FREE £10 bets. In order to claim your prize you'll be required to open a NEW Racebets account. Racebets' current welcome offer means you can double your first deposit up to £50 when you use the code WELCOME so you can also take advantage of that offer even if you don't win one of my my free bets. This competition will be run jointly on Twitter (@mrfixitstips). All entries will be collated and the winners drawn at random and announced before midnight on Monday 21st January. You will need to open a NEW Racebets account via this site to claim your free bet. Admin will send instructions to winners. Mr Fixit's decision is final. strange i typed ”betsrace” and it changed it to racebets, guess i’m in.